Alia Malley (b.1973, California) received her BA in Critical Studies from USC School of Cinematic Arts in 1994, and her MFA in Visual Arts from University of California Riverside in 2010. She was the recipient of the 2011 CENTER Dealer’s Choice Award, and the 2010 Merck Award at Darmstädter Tage Der Fotografie, Germany. In 2011, she was selected for the Fundación Botín - Taller de Paul Graham in Santander, Spain, and in 2013 participated in the Farm Foundation’s Arctic Circle residency in Spitsbergen, Svalbard. She was selected for the 2015 Field-Notes Hybrid_Matters residency at the Kilpisjärvi Biological Station in Lapland, Finland. Malley was recently awarded a National Endowment for the Arts "Our Town" Grant through the City of Santa Monica for a video projection which took place at Bergamot Station in August 2016. There is a famous quote, alternately attributed to George Burns, Jean Giradoux, or Groucho Marx, the gist of which goes: “The key to success is sincerity. And if you can fake that, you’ve got it made.” A related statement of sorts might be made about photography and verisimilitude. Or at least it could, at one time: with a not-so-subtle nudge from digital FX, the medium has finally outgrown any expectations of documentary truthfulness. Yet history can be a stubborn thing, so photography still bears the legacy, and implicit burden, of depicting reality, even when we know for a fact that it doesn’t. Alia Malley’s recent show of photographic works titled “Captains of the Dead Sea” plays havoc with those expectations, to create a sort of dual universe straddling fact and fiction. On the surface, they determinedly appear to depict forlorn extraterrestrial vistas such as the surface of Mars, or views peering out of space capsules, in a range of formats that would seem familiar to any NASA enthusiast. 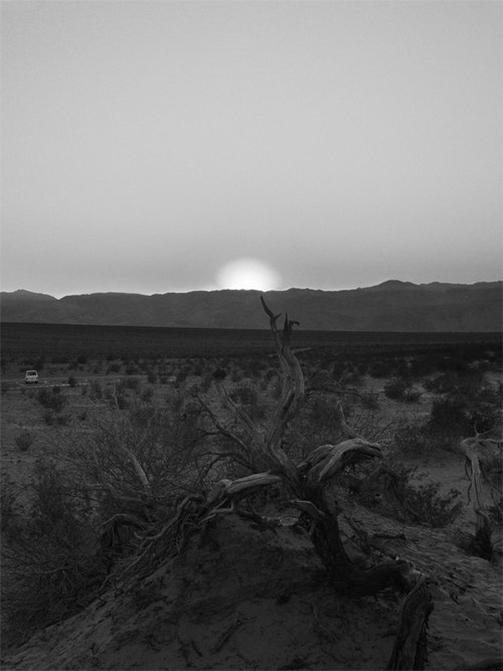 But Malley, an LA-based artist who received her BA from USC’s School of Cinematic Arts and her MFA from UC Riverside, did not fly to Mars to take these photographs; rather they were shot in nearby Death Valley and other earthly locales, mostly in the Southwest. Thus, these images are both a factual depiction of certain aspects of our own planet, and also a dismayingly plausible invented narrative in which the viewer willingly collaborates. 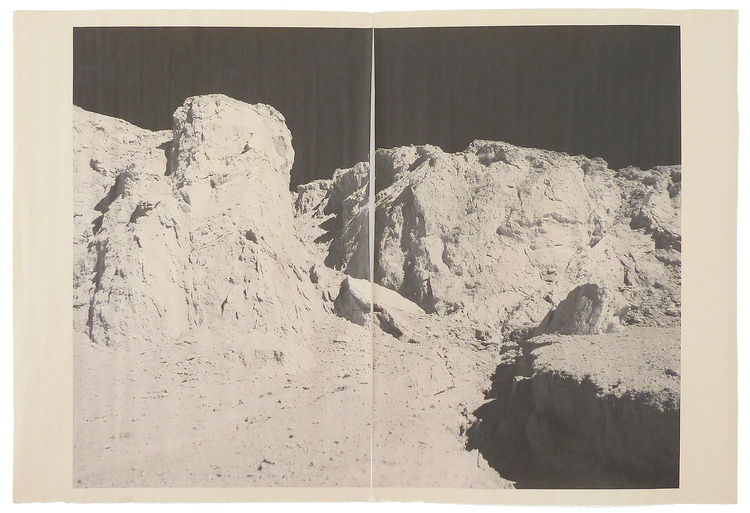 By presenting what we experience as forged evidence of space exploration, Malley’s work recalls the 1977 Hollywood thriller “Capricorn One,” (starring Elliott Gould, James Brolin, and O.J. Simpson, in a very ‘70s cast) which imagined a conspiracy around a faked mission to Mars. Malley has enormous fun riffing on this concept, playing it out in various skillful ways. Some of the photos depict aerial views of craggy mountains and valleys while others show imprinted evidence of humanity’s presence, like dirt roads, or, in one witty example, solemn close-ups of patterned footprints. The fact that many of these photos are printed on newsprint adds to their seeming texture of immediacy and truthiness. A few teasing pieces show what look like views from above the earth’s atmosphere or through a circular space capsule window amidst blurs of refracted light. Beyond mere gimmickry, her images linger, despite the questions they provoke Although fully aware of the charade, ultimately we do see the earth with renewed sense of wonder through her craft, and eye. In his essay “The Ontology of the Photographic Image,” film theorist André Bazin observed that image-making was “no longer a question of survival after death, but of a larger concept, the creation of an ideal world in the likeness of the real, with its own temporal destiny.” Under the lens of this 70-year old phrase, telescoped layers of meaning unroll panoramically from “Captains of the Dead Sea,” Alia Malley’s exhibition of Southwestern desert photographs that masquerade as aged snapshots from other planets and collectively imply a fabricated narrative of early space exploration. We understand outer space primarily through images, which at best are spurious mediators whose fidelity may be further muddied by human conjecture and political motives. After all, conceptions propelling extraterrestrial investigations are necessarily geocentric. In this sense, extraterrestrial exploration and documentation thereof involve reaching for “an ideal world in the likeness of the real.” Malley’s exhibition reflects this notion while mining its epistemological dubiousness. Shot in places like Death Valley and Arizona, her landscape photos convey the vast nothingness and confusing topography usually associated with scenes from outer space. In DV_8302(2014), for instance, a whitish expanse that is probably a dry lake of alkali deposits looks as much like a swirling cloud on a Jovian planet. 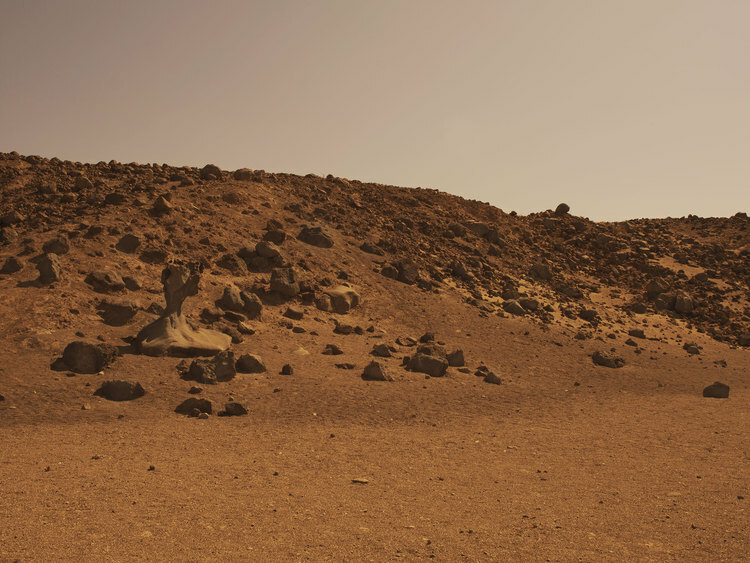 DV_8332 (2014/2015) could easily stand in for Mars terrain. Other images more literally suggest space exploration clichés, like DV_7202 (2013/2015), which shows footprints in dirt. A few portray astronomical events as seen from Earth; LA_30154 (2013/2015) captures a moment from a transit of Venus. Newsprint surfaces dull the images’ already muted colors, conferring upon them a timeworn appearance. Affectation of old newspaper clippings is furthered by the fact that each image is printed much smaller than its paper surface and is therefore surrounded by a wide frame of yellowish paper.DV_7276 (2013/2015) is divided in half, resembling a periodical spread. Most of Malley’s photos are unique prints whose paper surfaces, even those framed behind glass, are not perfectly flat. 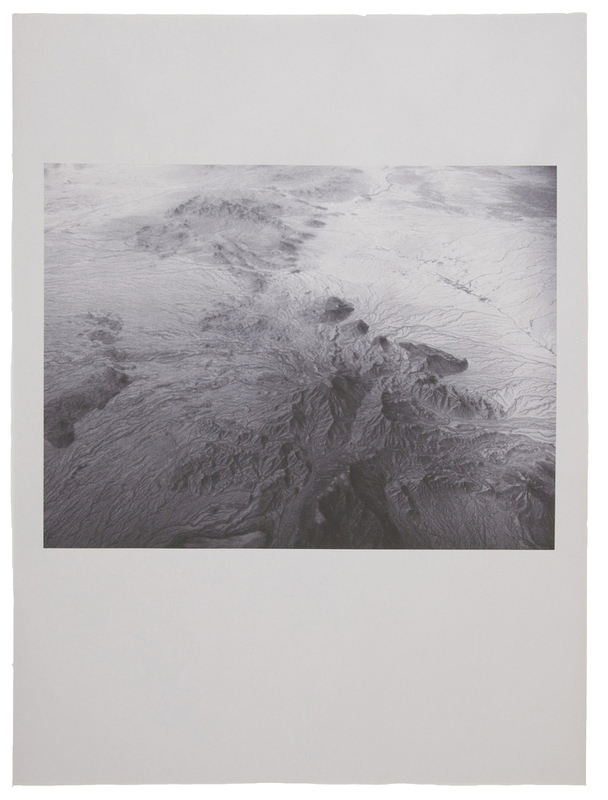 Delicately rippled newsprint resonates the rugged topography, most notably in AZ_1140 (2013/2015). The umbra of an outcropping in DV_8332 is echoed by a real shadow that the large sheet of newsprint casts on the gallery wall. 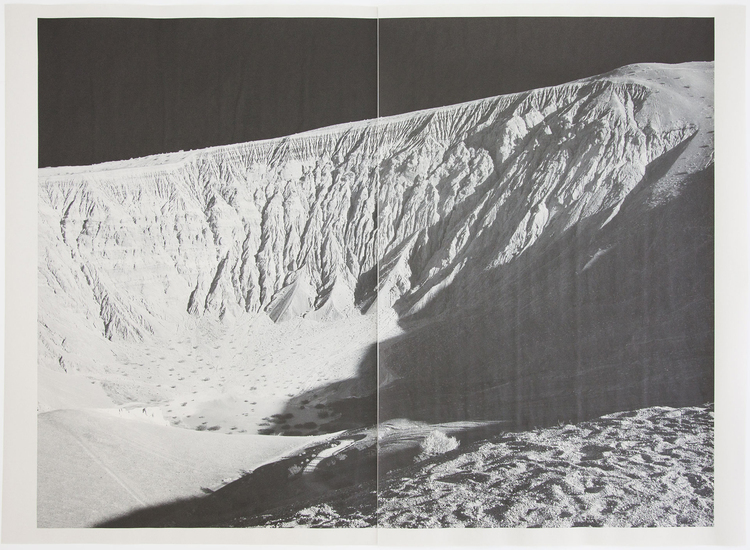 These singular physical attributes heighten the photos’ artifactual appearances while insinuating that as 3D objects, Malley’s pictures parallel their depicted scenes even as they reference parallels between earth and other planets. Likewise, Malley assumes the persona of a collector of newspaper clippings—or a fabricator of them, depending on the depth of one’s interpretation—whose nostalgic fantasies echo the wishful idealism implied by space exploration and its devotees. Launching rockets to places that few, if any, humans could ever visit indulges public curiosity and stimulates scientific research. The resulting images reveal little other than sparse emptiness while promoting folkloric mythologies about what could lie beyond our world. Befitting an age in which concern for our own planet supplants curiosity about others, Malley’s photographs insist that Earth can be as intriguing as any other place—yet a better world always lies just around the corner. b. 1973 La Jolla, California, USA. Beil, Kim. “A Lens on the Land.” Art Ltd March/April 2011: 48-52. Alia’s work is held in private and public permanent collections, including the Los Angeles County Museum of Art and the UCLA Library Special Collections.